BOSTON — Less than a decade after tears filled his eyes as he raised the Boston Celtics’ 2008 title banner, Paul Pierce was all smiles as his No. 34 went to the rafters at TD Garden during a jersey retirement celebration Sunday following the Celtics’ 121-99 loss to the Cleveland Cavaliers. Surrounded by his family, Pierce watched his No. 34 jersey takes its place alongside other Celtics legends and Boston’s 17 championship banners. He then grabbed the Larry O’Brien trophy from the 2008 NBA Finals and raised it in celebration at center court as Celtics fans roared and serenaded him with a “Thank You Paul Pierce” chant. “When you are forever with the Celtics, you’re forever,” Pierce said following the ceremony. Pierce is the 22nd number retired in Celtics history. He joined an eight-square banner that already featured the numbers of Dennis Johnson (3), Larry Bird (33), Kevin McHale (32), Reggie Lewis (35), Robert Parish (00), and Cedric Maxwell (31). There’s an open spot on the banner that seems likely to someday soon be filled by 2008 teammate Kevin Garnett, who was just one of the former Celtics in attendance for Pierce’s special day. Pierce seemed genuinely moved by their messages. Former Celtics coach Doc Rivers fulfilled a promise to Pierce by leaving his current team, the LA Clippers, for the day in order to be part of the festivities. Rivers, Celtics co-owner Wyc Grousbeck and president of basketball operations Danny Ainge each game speeches about what Pierce meant to the Celtics franchise and how his perseverance helped deliver the team’s 17th world title. Rivers noted how, during that 2008 season, he huddled Celtics players in Los Angeles and told them that they were going to beat the Lakers in the Finals and that everyone would eventually reconvene in Boston for Pierce’s jersey retirement ceremony. “Sometimes in life, you gotta dream first before it happens,” Rivers said. True to their word, many from the 2008 team were in attendance, including Garnett and Rajon Rondo. Rondo’s New Orleans Pelicans had a day off after playing in Brooklyn on Saturday. Other members of the 2008 title team on hand included James Posey (now a Cavaliers assistant), Brian Scalabrine and Leon Powe. Before Sunday’s ceremony, Rivers had noted how big of an honor it is for a player to have his jersey number retired in Boston. Flanked by his mother, his wife and his three children, Pierce reveled in the ceremony. The only time he lost control of his emotions was when he thanked his family and the crowd lifted him up with a standing ovation. After Grousbeck detailed how watching Pierce during some of Boston’s leanest years helped inspire him to buy the team, Rivers gushed about Pierce’s fearlessness on the court. The Celtics presented Pierce with a series of gifts during the postgame ceremony including a custom stained glass backboard with his No. 34, a framed collage including photos of Pierce with his 2008 Finals MVP trophy and a piece of the Garden parquet, and a replica of the banner that his number now adorns. 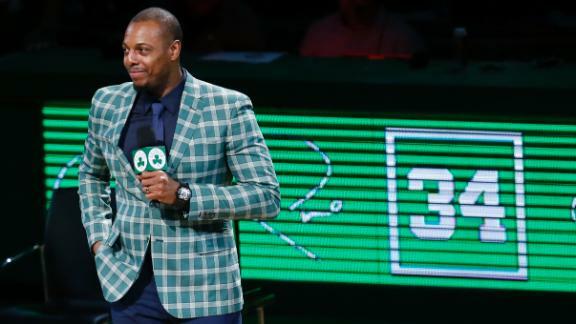 Pierce, resplendent in a green checkered blazer and blue tie, sat courtside for Sunday’s game. During stoppages in game action, the Celtics ran a series of videos celebrating Pierce’s basketball journey from Inglewood High to the University of Kansas to the Celtics. When it came time for his celebration, Pierce ditched a speech he had written and decided to just go from the heart. And he did his best to keep things together when it came time to raise his jersey number. “I was thinking about the last time I pulled ropes up there I was tearing up crying and I was trying not to cry,” Pierce said. “When we raised the championship banner, that’s when it all came out. It came out bad that day.